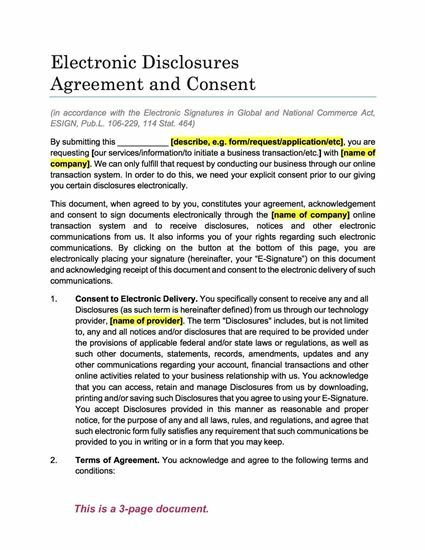 This Electronic Disclosures Agreement and Consent form can be used by websites that conduct interstate commerce and that take signatures and provide documents electronically. If your customers send you instructions or requests via online forms, or if they sign contracts or other documents online, that means they are signing electronically. The Agreement and Consent form is intended to be posted on the company's website to inform customers of the legality of their electronic signatures, in accordance with the U.S. Electronic Signatures in Global and National Commerce Act. The customer specifically consents to receiving notices and disclosures in an electronic form. The customer acknowledges that their electronic signature has the same legal validity as their handwritten signature. The customer has the right to withdraw consent at any time and to request paper copies of any document instead of receiving it in electronic form. Prepare an Electronic Brokerage Agreement for a brokerage services website with this easy-to-use template. All proprietary information on the site is the property of the site owner. The site owner does not provide professional advice of any kind. The customer authorizes the brokerage site to accept buy and sell orders. A list of fees and charges for the brokerage services. The brokerage has limited liability for damages resulting from the use of the site services by the customer. This Electronic Brokerage Agreement is provided in MS Word format, which can be converted to html for posting on your website. 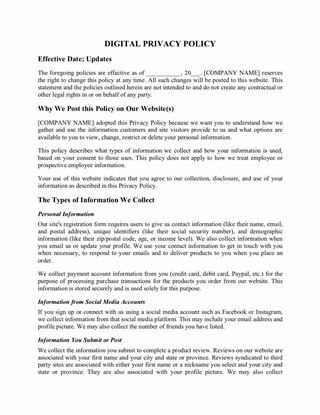 Create a set of online purchase terms and conditions for your e-commerce website with this customizable template. 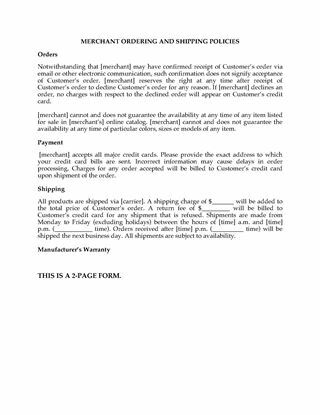 These E-Commerce Website Purchase Terms and Conditions are provided in MS Word format, which can be easily converted to html for posting on your website. Set out the policies governing all site visitors to your website with this Website Policy Statement. This Website Policy Statement is available in MS Word format, which can be converted to html.